“Even before their division into two parties, the politics of SDP looked rather schizophrenic: while their ministers still sat in the government which I head, they had frequent ad hoc alliances with the opposition, thanks primarily to their leader and Parliament president, Ranko Krivokapic, trying to present themselves in the Assembly as a kind of “opposition within the government” – said Djukanovic. His is why he, in late January 2016, launched the initiative to vote for the confidence in the government. During the three-day parliamentary debate, he said, when the government received majority support, DPS’s long-time coalition partner moved to the opposition benches. 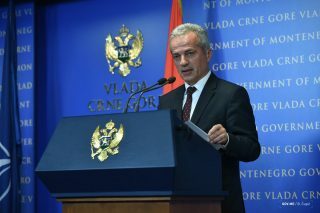 “With the exception of the head of the party and President of the Parliament, Ranko Krivokapic, who, although his party just became the opposition, insisted that he alone, at all costs, remains as president of the Assembly”, Prime Minister added when asked to explain why the last three years have been the hardest for him. Prime Minister added joining NATO not only crowns Montenegro’s accomplished reforms, but also proves that a modern country can change the cycle of its turbulent history which cripp;ed its economic and democratic development. Talking about politics in the 90s, Prime Minister said he confesses he was led by the exaggerated and therefore irrational “Yugoslav emotion”. “As the first president of a country in the former Yugoslavia in 2000, I apologized to Croatia for everything that any citizen of Montenegro in JNA uniform did to any Croatian citizen in those years, and as you know, then-president Stjepan Mesic and official Croatia, with which Montenegro has quality neighborly relations and cooperation, have accepted this apology”, said Djukanovic. When asked about Russia’s reaction to NATO invitation, Montenegrin Prime Minister said he was surprised to receive such sharp-tone messages from Moscow directed against Montenegro and him personally. “Although I expected Russia will, as in previous cases of enlargement, oppose Montenegro’s entry into NATO, it really surprised me to see this directness, sharpness and personalized focus. I think that such a reaction is definitely not becoming a country of such global importance and size, such grandiose culture and history. Especially when you consider that it is addressed at the smallest country in the Balkans, with which Russia has three centuries of official political relations”, he said explaining that Montenegro found itself in the position of collateral damage because of a serious disruption of Europe – Russia and Russia – America relations. When asked about the reaction of Montenegrin citizens on such attacks, Mr. Djukanovic said they were “traditional”, explaining that this means sentiments of a part of the Montenegrin political and social scene were awakened, in line with the previous specific historical experiences. He added certain party leaders, with no ideological affiliation, simply tried to manipulate the public with the aim of grabbing power by misusing another’s authority, as seen on October 24, 2015, when supporters of the Democratic Front (DF) “attacked the constitutional order by forcibly trying to take over the Parliament of Montenegro”. Asked about DF’s “military formation”, Djukanovic said the political alliance formally calls it their “peacekeeping” service, “although it is clearly and intentionally reminiscent of a military structure, moving through Montenegro in uniforms with emblems of another country – Serbia”. Commenting the group’s affiliation with Russia, Prime Minister said the only curious thing is the official Moscow’s choice to maintain contact with Montenegro through its opposition parties. Asked whether this means DF is indeed Russia’s “wildcard” in Montenegro, Prime Minister said “Democratic Front is primarily a political symbol of inferior consciousness, which always aims to achieve its political objectives seeking help from abroad”. “In the previous two decades, these men saw themselves as the exponents of Great Serbian politics, so no one was very surprised when they sought for their destructive, anti-Montenegrin objectives, the help of Slobodan Milosevic primarily, and then later on, of Vojislav Kostunica. 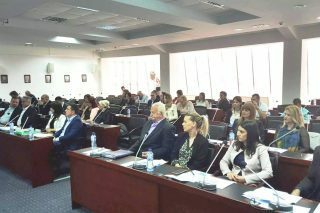 It is interesting, however, that just a few years ago, the head of DF, Andrija Mandic, who is now at the forefront of anti-NATO protests in Montenegro and who vows to ‘mommy Russia’, went to the US Ambassador in Podgorica to offer his services in support of Montenegro’s entry into NATO, in exchange for help with ousting the Montenegrin government.. When this failed, they turned to Moscow. But they are dishonest with them, just as they were with Washington and Brussels. They still promise they can topple the government in Montenegro and undo its independence. This is why I say DF stands more fore unrealistic ambitions than any serious conviction, ideology or of principle”, stressed Djukanovic. Asked about Milorad Dodik as “the key Russian player in the Balkans”, Prime Minister said he remembers Mr. Dodik as a very sincere and courageous man, anti-nationalist, who fought Milosevic’s political engagement, with whom he visited many major western European and US addresses, trying to introduce the policy of the European future for the region. “I also remember his support for democratic renewal of Montenegrin statehood”, Djukanovic stressed. Asked to comment speculations that former Prime Minister and Vice President of DPS, Igor Luksic, allegedly planned his removal with Mandic, Medojevic, Miodrag Lekic, President of the Parliament Ranko Krivokapic, Prime Minister Djukanovic said that indeed, at the time, there were “such unrealistic plans”. “I mean the circles around Vijesti and Monitor media outlets, which every now and then form a political party to use to try to take power in order to protect their substantial assets, which they incidentally gained in this system they want to topple. In order to do so, they wanted to rely on what they call “the healthy structures of DPS”, which would enable them to change of government by removing me from the political life, and all in order to protect the ownership and management structure in their media, which were, even by their German partners, at the end of their joint and unsuccessful businesses, described as – criminal”, the Prime Minister said explaining that he does not know whether owners of Vijesti and Monitor ever set their sights on Luksic or Krivokapic. “But I know that such ideas have never been reported in our party. Did they believe in this illusion because of their intimacy with some people from DPS? Possibly. However, divisions they counted on never had a minimal chance within our party”, Djukanovic was explicit. Commenting the anti-NATO protests, he said the rhetoric of the SPC intensified as Montenegro was getting closer to NATO, but also that it turned out that the vocabulary of the SPC is not only anti-NATO, but also extremely anti-European. He said Montenegro had a similar situation before the referendum in 2006, and survived. Asked about why he hasn’t had an official visit with Chancellor Angela Merkel, Djukanovic said he met with Merkel on a number of occasions, during numerous international conferences, and that he stopped initiating meetings with officials for a photo shoot for domestic use a long time ago. “After all, after twenty-five years of active participation in political life, I know very well that personal and party ratings are not dependent on the outside support, but they are primarily the result of responsibility we show on the local scene. International circles know this and treat us accordingly”, he said. Prime Minister did not hide, however, that he felt very proud to be supported by US Vice President Joe Biden, and very happy about his repeatedly publicly expressed support for Montenegro and him personally. He said this is because America is the most powerful government on the planet and also the leader of NATO. Commenting Sutorina and the fact that the Bosniak Party very strongly opposed the idea that it be given to Bosnia and Hercegovina, Djukanovic said “every country could only wish for loyalty that all minority peoples show towards their country, Montenegro”. Asked about the architects of the idea to “restore Sutorina to BiH”, Djukanovic said it could very well be someone outside Bih, who does not like Montenegro’s progress in the EU integrations. Prime Minister also added the attitude of the official state policy of Serbia toward Montenegro has been significantly enhanced since 2012 and that, despite certain disagreements with the Serbian Presidency, Montenegro does not see the formerly predominant destruction. “Instead, we see appreciation of reality: they know we are a country that chooses its own way.. It is true that there are occasional “political trips” which resemble the politics of Milosevic and Kostunica, but Montenegro responds with disagreement, which implies statesmanlike responsibility and decency. Just like Montenegrin President Filip Vujanovic demonstrated. Clearly, Montenegro will never let anyone offend it or disparage, but it also cannot afford the luxury of conflicts and strife, wasting time in meaningless and futile political squabbles and discussions”, Djukanovic said, among other things.